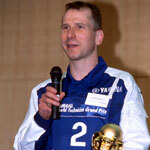 Yamaha World Technician GP 2002 Yamaha service technicians from 11 countries compete with all-around service skills - News Releases | Yamaha Motor Co., Ltd.
On April 5, the Yamaha World Technician Grand Prix 2002 contest for Yamaha motorcycle service technicians (dealership mechanics) from around the world was competed at Yamaha Motors headquarters in Iwata, Shizuoka Prefecture, Japan. 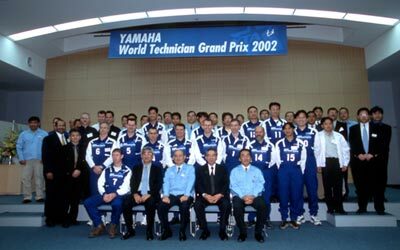 This was the first time that such a contest was held on an international scale and the 17 finalist contestants from 11 countries who gathered in Iwata to vie their service skills for the Grand Prix were the winners of local preliminaries that drew some 1,500 Yamaha service people from 15 countries since the contest was announced in March 2001. The contest was judged on total points from tests of the technicians skills in four areas: 1) a written exam covering motorcycle engineering, Yamaha products and market situations, 2) a practical technical skills test, 3) a measurement skills test and 4) a customer reception skills test. The overall winner was Mr. Beat Burkhalter of Burkhalter Motos in Switzerland, with 2nd place going to Mr. Takuya Takahashi of Yamaha Sports Plaza Fussa Higashi in Tokyo and 3rd place to Mr. Mark Sullivan of Bike Biz in Australia and Mr. Geu-Hon Lin of I Li Auto. Co., Ltd. in Taiwan. This contest was organized as one program of the Global Service Education Mid-term Plan that Yamaha Motor has been promoting since 2000 under the theme One-To-One ServiceWe create a good relationship with each customer. Its aim is to help increase customer satisfaction by improving the skills of Yamaha service people and building a stronger consciousness of the global Yamaha group. The 11 countries from which the final contestants were selected included Australia, Belgium, Canada, Colombia, France, Indonesia, Japan, the Netherlands, Taiwan, Thailand and Switzerland, and plans call for this competition to be held biennially from now on. The contest will be competed by about 20 top finishers in the preliminary national contests in 27 countries and regional contests in eight regions of the world. 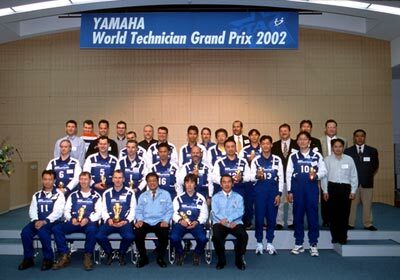 The contents of the 2002 contest included (1) a Written Exam covering motorcycle engineering, Yamaha products and market knowledge (50 min. ), (2) a Technical Skill Contest in which contestants performed an overhaul of an actual motorcycle to repair failed parts according to provided directions (50 min. ), (3) a Measurement Skills Contest of measuring skills using five instruments to test brake pads, ignition coil resistance, valve clearance, etc. (25 min. ), and (4) a Customer Reception Skills Contest using a simulation of customer reception at the shop (10 min.). Based on the total points from these four tests the 1st, 2nd and 3rd place winners are chosen. The Measurement Skills Contest covered electronic components, valve clearance, etc. 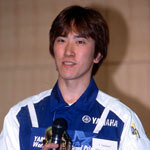 Yamaha Motor Co., Ltd. (YMC) established its Global Service Education Mid-term Plan in April of 2000 and has since been working toward the realization of its goals. Under this plan, the Service Dept. 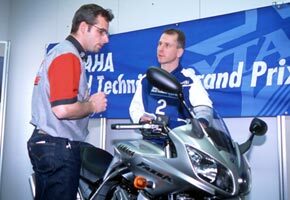 of Yamahas Headquarters in cooperation with the service department of Yamaha group companies the world over are working toward the goal of offering Yamaha customers the same high level of technical service at dealerships throughout the world. Plans call for the completion of this new system by the end of 2003 that will serve to provide greater customer satisfaction than ever before. 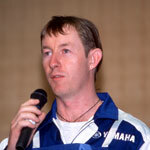 The program defined by this Global Service Education Mid-term Plan is characterized by a unique Yamaha technical education system. 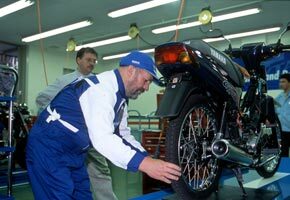 This system for the education of service people is called the Yamaha Technical Academy (YTA) and it is designed to produce of base of skilled mechanics who will enable the supply of the same high level of technical service at Yamaha dealerships throughout the world. In specific terms, it provides worldwide-unified educational texts, curriculum, qualification and accreditation systems that will serve as the basis for supplying high-level service. The education of service people is conducted through four types of activities: 1) the establishment of a network of educational bases at main dealerships in each country, 2) conducting training at YMC headquarters of the instructors who will teach at each of these educational bases, 3) instructors from each country receive training from instructors in neighboring countries and in turn give instruction to dealer service people in their own country and, 4) a World Technician GP with regional and world contests is organized. This service education system centered around the Yamaha Technical Academy (YTA) divides the world into six regions in which 10 educational bases are located. 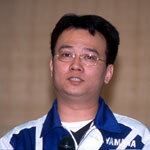 The six regions and ten bases include: (1) Asia (Yamaha Motor Taiwan, YMKI, T.T.C. China), (2) Europe (Yamaha Motor Europe NV, MBK), (3) Central and South America (YMDB, INCOLMOTOS), (4) North America (YMUS), (5) Oceania (YMA), (6) Japan (Yamaha Motor Marketing Co., Ltd.).